Recent experimental and human studies have shown that hyperuricemia is associated with hypertension, systemic inflammation, and cardiovascular disease mediated by endothelial dysfunction and pathologic vascular remodeling. Elevated levels of C-reactive protein (CRP) have emerged as one of the most powerful independent predictors of cardiovascular disease. In addition to being a marker of inflammation, recent evidence suggests that CRP may participate directly in the development of atherosclerotic vascular disease. For investigating whether uric acid (UA)-induced inflammatory reaction and vascular remodeling is related to CRP, the UA-induced expression of CRP in human vascular smooth muscle cells (HVSMC) and human umbilical vein endothelial cells (HUVEC) was examined, as well as the pathogenetic role of CRP in vascular remodeling. It is interesting that HVSMC and HUVEC expressed CRP mRNA and protein constitutively, revealing that vascular cells are another source of CRP production. UA (6 to 12 mg/dl) upregulated CRP mRNA expression in HVSMC and HUVEC with a concomitant increase in CRP release into cell culture media. Inhibition of p38 or extracellular signal–regulated kinase 44/42 significantly suppressed UA-induced CRP expression, implicating these pathways in the response to UA. 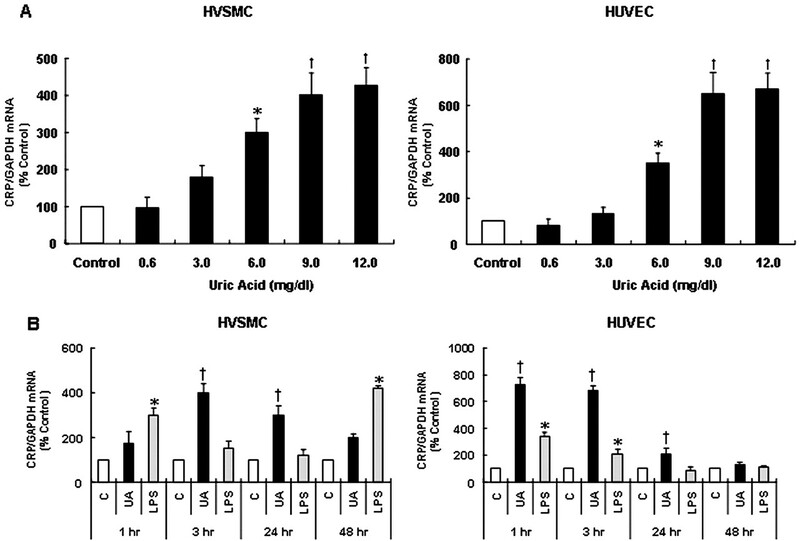 UA stimulated HVSMC proliferation whereas UA inhibited serum-induced proliferation of HUVEC assessed by 3H-thymidine uptake and cell counting, which was attenuated by co-incubation with probenecid, the organic anion transport inhibitor, suggesting that entry of UA into cells is responsible for CRP expression. UA also increased HVSMC migration and inhibited HUVEC migration. In HUVEC, UA reduced nitric oxide (NO) release. Treatment of vascular cells with anti-CRP antibody revealed a reversal of the effect of UA on cell proliferation and migration in HVSMC and NO release in HUVEC, which suggests that CRP expression may be responsible for UA-induced vascular remodeling. This is the first study to show that soluble UA, at physiologic concentrations, has profound effects on human vascular cells. The observation that UA alters the proliferation/migration and NO release of human vascular cells, mediated by the expression of CRP, calls for careful reconsideration of the role of UA in hypertension and vascular disease. Individuals at risk for developing hypertension and cardiovascular disease frequently have evidence for a systemic inflammatory response, often marked by elevations of C-reactive protein (CRP) in their blood (1). Elevated levels of CRP have emerged as one of the most important predictors of myocardial infarction, stroke, and vascular death, with prognostic value exceeding that of LDL cholesterol (2,3). Although CRP was originally considered solely a marker of the inflammatory response, recent observations from several groups suggest that CRP also has a direct effect to promote atherosclerotic processes such as endothelial inflammation and vascular smooth muscle proliferation (4–7). CRP, at concentrations that are known to predict diverse vascular insults, profoundly quenches nitric oxide (NO) synthesis while augmenting the expression of vasoactive mediators with upregulation of adhesion molecules and chemokines (7,8). In addition, CRP facilitates endothelial cell apoptosis with activation of NF-κB (9) and attenuates endothelial progenitor cell survival (10). Therefore, CRP is not only a biomarker of atherosclerotic events but also seems to partake actively in plaque formation and cardiovascular morbidity. An elevated serum uric acid (UA) in humans is also associated with systemic inflammation (11), increased CRP levels (12), endothelial dysfunction (13, 14), hypertension (15), and cardiovascular disease (16). Despite a clear association between serum UA level and various cardiovascular morbidity in humans, most authorities do not consider UA as having a pathogenetic role in these conditions and have viewed soluble UA as biologically inert or possibly anti-inflammatory because it may function as an antioxidant (17). However, we and others have reported that noncrystalline UA stimulates rat vascular smooth muscle cell (VSMC) proliferation with the activation of mitogen-activated protein kinases (MAPK) (18,19), growth factors (PDGF), chemokines (monocyte chemoattractant protein-1 [MCP-1]), and inflammatory enzymes (COX-2) (20). Hyperuricemic rats (induced by blocking uricase) also develop hypertension, vascular disease, and renal disease with inflammatory cell infiltration and COX-2 expression (21,22). Despite striking common features in vascular changes by UA and CRP, there are no data on whether UA-induced inflammatory reaction in blood vessels and kidney is also related to CRP expression. To clarify the relationship of UA with the systemic inflammatory response, we investigated the effect of UA on CRP synthesis in human vascular cells. We first checked whether human vascular cells can be a source of CRP expression. Next, we examined whether the stimulation of human vascular cells with various concentrations of UA altered the expression and release of CRP. Finally, we investigated whether de novo expression of CRP plays a role in UA-induced changes in proliferation/migration and NO release of vascular cells. Human umbilical vein endothelial cells (HUVEC) were isolated from fresh newborn umbilical veins according to the conventional protocol (23) and cultured at 37°C under 5% CO2 in M199 supplemented with 20% FCS, 100 units/ml penicillin, and 100 μg/ml streptomycin. Human vascular smooth muscle cells (HVSMC) were isolated from the thoracic aorta of heart transplantation donors (24). Tissue collection was approved by the Ethics Committee of the institution. HVSMC were cultured in DMEM (Life Technologies BRL, Grand Island, NY) that contained 20% FBS (Life Technologies BRL). Purity of HUVEC (passages 2 to 5) and HVSMC (passages 5 to 10) was shown by staining with antibodies to von Willebrand factor and α-smooth muscle actin, respectively. UA (Ultrapure, 0.6 to 12.0 mg/dl; Sigma, St. Louis, MO) was dissolved in warmed media and filtered and was free of crystals (by polarizing microscopy), endotoxin (limulus amebocyte assay; BioWhittaker Inc, Walkersville, MD), and mycoplasma contamination (Immu-Mark Myco-Test, ICN Biomedicals, Irvine, CA). HUVEC and HVSMC were treated with UA (0.6 to 12.0 mg/dl) up to 48 h, and total cellular RNA was extracted by TRIZOL reagent according to the manufacturer’s protocol (Life Technologies BRL). The RNA pellet was suspended in diethylpyrocarbonate-treated distilled water and stored at −70°C until subsequent analysis. The purity of each RNA preparation was evaluated by the ratio of the absorbance at 260 nm to that at 280 nm, and the integrity of the preparation was assessed by agarose (1.7%)/formaldehyde (0.66 M) gel electrophoresis. To confirm the effect of UA’s entering into cells, we also performed all experiments with co-incubation with probenecid (1 mM/L), an organic anion transport inhibitor that blocks UA entry into cells). Primers were 5′-ACAAGGCTGATTCAGAGACTCC-3′ (forward) and 5′-ACCTGGGACCACCAGTAGC-3′ (reverse) for human CRP and 5′-ACCACAGTCCATGCCATCAC-3′ (forward) and 5′-CACCACCTTCTTGATGTCATC-3′ (reverse) for glyceraldehyde-3-phosphate dehydrogenase (GAPDH). cDNA was produced using TaqMan reverse transcription kit according to the manufacturer’s protocol (Perkin Elmer, Foster City, CA). The PCR protocol consisted of an initial denaturation step of 95°C for 5 min, followed by 40 amplification cycles of 30 s at 95°C, 30 s at 60°C, and 60 s at 72°C. The absence of nonspecific PCR products was confirmed by electrophoretic separation of the products in 12% polyacrylamide gels and ethidium bromide staining (Figure 1). Representative PCR result of C-reactive protein (CRP; 138 bp; B) and glyceraldehyde-3-phosphate dehydrogenase (GAPDH; 86 bp; A) showing the specificity of the PCR reaction. Real-time PCR was performed on ABI-Prism 7900 using SYBR Green I as a double-stranded DNA-specific dye according to the manufacturer’s instructions (PE-Applied Biosystems, Norwalk, CT). The condition for the amplification of CRP was 95°C for 30 s (denaturation), 60°C for 30 s (annealing), and 72°C for 30 s (extension). For amplification of GAPDH, the conditions for denaturation, annealing, and extension were 95°C for 5 s, 60°C for 10 s, and 72°C for 20 s, respectively. In all cases, the initial denaturation was carried out at 95°C for 5 min. All PCR reactions were performed in duplicate. Negative control samples were processed in the same manner, except that the template was omitted. Representative progress curve for the real-time amplification of CRP cDNA is shown in Figure 2A. Calibration curve was constructed by plotting the cross point (Ct) against known amounts of purified amplicon (Figure 2B). The Ct is the cycle number at which the fluorescence signal is greater than a defined threshold, one in which all of the reactions are in the logarithmic phase of amplification. For quantification, CRP mRNA expression was normalized with GAPDH. As a positive control for CRP mRNA expression in human vascular cells, we stimulated the cells with Escherichia coli LPS (1 μg/ml; Sigma) (25) and compared the effect of UA with LPS-induced CRP mRNA expression. Real-time amplification plot and standard curve for CRP. Representative progress curve for real-time amplification of CRP cDNA. Shown is a plot of an increase in fluorescence signal versus PCR cycle number for the amplification of serial dilutions (1, 0.5, and 0.25) of cDNA (A). Calibration curve for the real-time PCR amplification of CRP cDNA (B). Shown is a plot of the cross point (Ct) versus known amounts of amplicon. For Western blotting for CRP protein expression, HVSMC and HUVEC were exposed to UA (9 mg/dl) for 1 to 48 h, and cells were solubilized with lysis buffer. Protein samples (30 μg measured by Bio-Rad, Hercules, CA) were mixed in reducing buffer, boiled, resolved on 7.5% SDS-PAGE gels, and transferred to a nitrocellulose membrane by electroblotting. Membranes were blocked in 5% wt/vol nonfat milk powder in Tris-buffered saline for 30 min at room temperature. 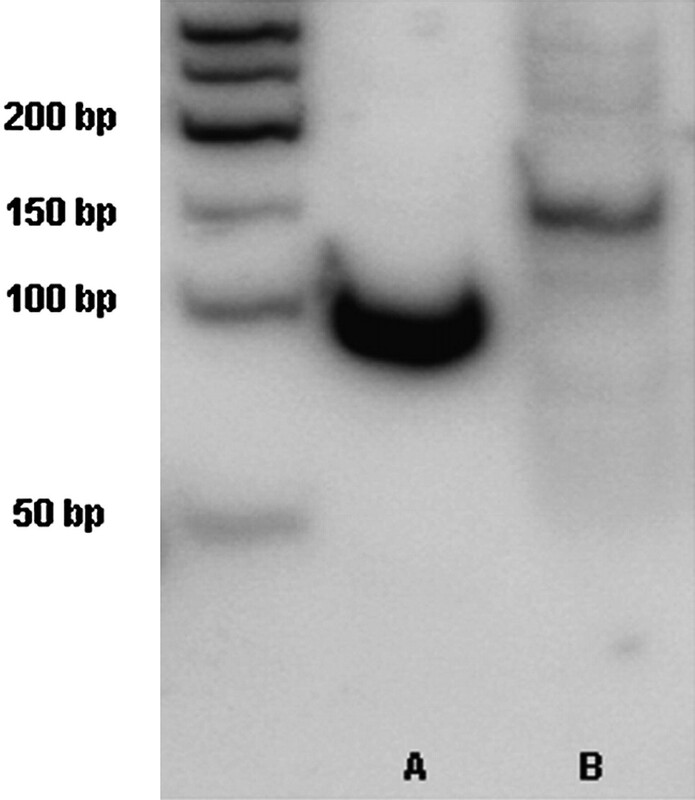 An affinity-purified rabbit polyclonal antibody to human CRP was used (Santa Cruz Biotechnology, Santa Cruz, CA). This was followed by wash and incubation with alkaline phosphatase–conjugated mouse anti-rabbit antibody (Santa Cruz Biotechnology) and enhanced chemiluminescence detection (ECL, Amersham Life Science, Little Chalfont, UK). Positive immunoreactive bands were quantified by densitometry and compared with the β-actin expression (Sigma). CRP secretion from vascular cells was evaluated by ELISA (Diagnostic System Laboratories, Webster, TX). Experiments were performed in triplicate and verified on four to six occasions. Cells were cultured in six-well plates and incubated with UA and other reagents for 1 to 48 h after 24 h of complete serum restriction. Cell culture supernatants were concentrated 10-fold using a centrifugal filter (Centricon; Millipore, Billerica, MA), and CRP protein concentration was expressed as total supernatant CRP per microgram of cell protein (pg/μg). The minimum detectable concentration of the assay was 1.6 ng/ml with an inter- and intra-assay variability of 5.0 and 3.5%, respectively. Because we have found that p38 and extracellular signal–regulated kinase (ERK) 44/42 MAPK phosphorylation are involved in the UA-induced cell proliferation and activation in rat vascular cells, we assessed the activation of these two MAPK in UA-stimulated human vascular cells. HVSMC and HUVEC were exposed to UA (9 mg/dl) for 5 min to 6 h, and cell lysates were treated for Western blotting as described above. After identification of active p38 and ERK44/42 (phosphorylated form; Cell Signaling), membranes were stripped of antibodies and reexamined for total p38 and ERK44/42. Horseradish peroxidase–linked secondary antibodies were used. We also determined the effect of blocking p38 and ERK44/42 MAPK in UA-induced CRP expression using specific inhibitors of the p38 (SB203580, 5 μM) and ERK44/42 (PD 98059, 10 μM) MAPK pathways. HUVEC and HVSMC at 70% confluence in multiwell plates (Becton Dickinson, Franklin Lakes, NJ) were changed into serum-free media for 24 h to synchronize cell growth. Cells were washed three times with HBSS and incubated with UA (0.6 to 12.0 mg/dl) for 24 h. [3H]thymidine (NEN Life Science Products, Boston, MA; 2 μCi/ml, specific activity 20 Ci per mM/L) was added during the last 6 h of incubation. After washing with 10% TCA, cells were digested in 0.5 N NaOH and radioactivity was counted with a β-scintillation counter (Beckman, Albertville, MN, Canada). Cell proliferation was also assessed by counting cells with a hemocytometer. All experiments were also performed with co-incubation with probenecid (1 mM/L). Cell migration was assessed by a monolayer cell–wounding assay. HUVEC and HVSMC at confluence were synchronized in 1% serum for 24 h in 60-mm plates. A longitudinal mid-plate incision was made with a sterile scalpel (scratch wound healing assay), and 2% FCS culture medium and UA at final concentration of 9 mg/dl was added. After 6 to 24 h of incubation at 37°C, cells were fixed with acetone and methanol 1:1 at −20°C for 10 min and stained with crystal violet. The width of the scratch was measured at the five narrowest parts. Results were expressed as percentage of control of the mean of the five measurements. Cell migration was also assessed using a modified 48-well Boyden chamber with 8-μm pore polyvinylpyrrolidone-free polycarbonate membranes (Neuro Probe Inc., Gaithersburg, MD). Filters were immersed overnight in 130 μg/ml matrigel (10 μg/ml; Becton Dickinson) in PBS at 4°C. Lower chambers were filled with 10% FCS and culture medium. The matrigel-coated membrane was placed over the lower wells. HVSMC and HUVEC at 70% confluence were starved overnight in serum-free medium, trypsinized, washed twice, and resuspended in medium with 1% FCS at a concentration of 15,000 cells in 50 μl. UA at a final concentration of 9 mg/dl with or without probenecid was added to 2 ml of cell suspension and incubated for 24 h at 37°C. Cell suspension samples were added to the upper well in 50-μl aliquots, and the chamber was incubated at 37°C for 6 h. The membrane was removed, and the cells on the upper side were scraped off. The membrane was fixed on the filter with methanol and stained with hematoxylin-eosin, and the cells on the lower side of the membrane were counted manually. At least four high-power fields (×400) were counted per well and averaged. Each sample was assayed in triplicate in four separate experiments. HUVEC were incubated with UA (0.6 to 12.0 mg/dl, 24 h), followed by reduction of all nitrates with nitrate reductase using the Griess reaction (Boehringer Mannheim, Indianapolis, IN). Total nitrite was determined spectrophotometrically at 540 μm, using a standard curve constructed over the linear range of the assay and expressed as percentage of control value without UA stimulation. To investigate whether UA-induced alterations in cell proliferation/migration and NO release are related to CRP expression, we treated cells with UA in the presence or absence of anti-CRP antibody or control IgG for 24 h. Lipid-extracted ammonium sulfate IgG fraction of goat anti-human CRP and normal goat IgG obtained by ion exchange chromatography were used. Cell proliferation and migration were assessed by 3H-thymidine uptake and scratch wound healing assay. In a separate experiment, for verification of the efficacy of immunoprecipitation of UA-induced CRP release with anti-CRP antibody, UA-conditioned media with or without anti-CRP antibody were collected and incubated with rabbit anti-goat secondary antibody for 1 h at room temperature. Thereafter, conditioned medium was centrifuged (2500 rpm for 5 min), and Western blotting for CRP was performed with supernatant. Co-incubation of anti-CRP antibody at a dilution of 1:10 and 1:100 with UA resulted in an immunoprecipitation of released CRP and a markedly decreased density of CRP band in the conditioned media of HVSMC and HUVEC (Figure 3). This demonstrates that the anti-CRP antibody could reduce the amount of CRP released into the culture media after incubation of vascular cells with UA. Western blot analysis for CRP in conditioned media after incubation with anti-CRP antibody. Human umbilical vein endothelial cells (HUVEC) and human vascular smooth muscle cells (HVSMC) were incubated with uric acid (UA; 9 mg/dl) and anti-CRP antibody (1:10 and 1:100 dilution) for 24 h, and the conditioned media were examined for CRP by Western blotting. As can be seen, incubation with increasing concentrations of anti-CRP resulted in a progressive decrease of CRP in the conditioned media. This demonstrates that the anti-human CRP antibody can decrease the amount of CRP in the media. All data are presented as mean ± SD. Differences in the various parameters for each time point and condition were examined by repeated measure ANOVA. When variance reached statistical significance, the means were analyzed using Kruskal-Wallis ANOVA. Significance was defined as P < 0.05. HUVEC and HVSMC constitutively express CRP mRNA by real-time PCR. UA increased CRP mRNA expression in a dose-dependent manner from a concentration of 6.0 mg/dl (Figure 4A) in both HVSMC and HUVEC. In HVSMC, UA-induced CRP mRNA expression peaked at 3 h (4.3-fold) and remained elevated at 24 h (2.8-fold) compared with control (Figure 4B). In HUVEC, CRP mRNA increased at 1 h (7.2-fold versus control) and 3 h (6.5-fold versus control) compared with controls at each time point and remained elevated at 24 h (Figure 4B). Because LPS is known to induce CRP expression in human vascular cells (25), we compared the effect of UA with LPS on CRP production. 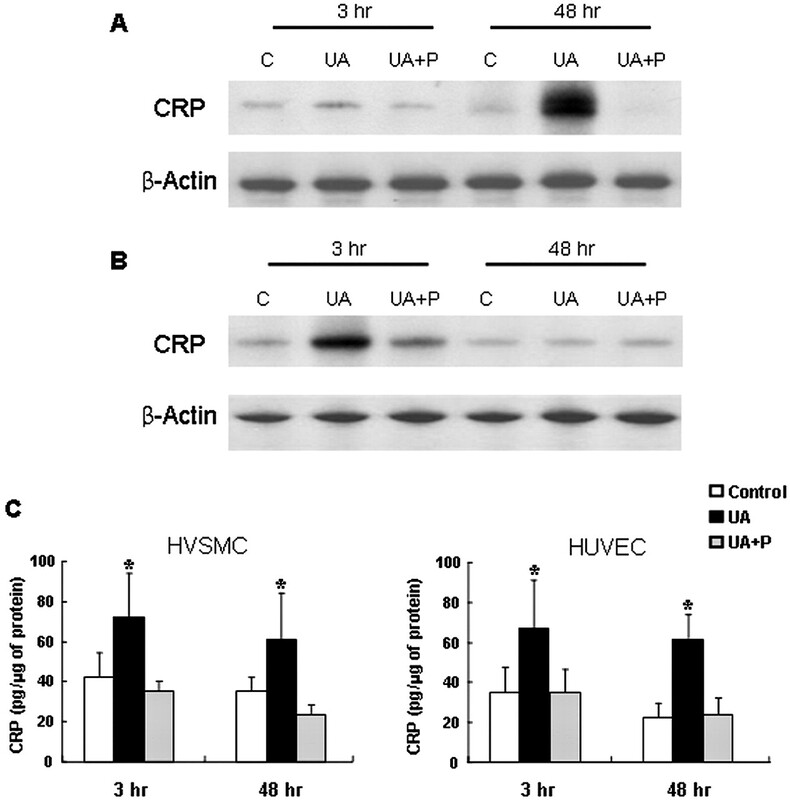 LPS increased CRP mRNA expression with a different time response in HVSMC and HUVEC. In HVSMC, LPS stimulation resulted in a stronger expression in CRP mRNA compared with UA at 1 h with a secondary peak at 48 h. In HUVEC, LPS induced a transient and weaker CRP mRNA expression at 1 and 3 h compared with UA. 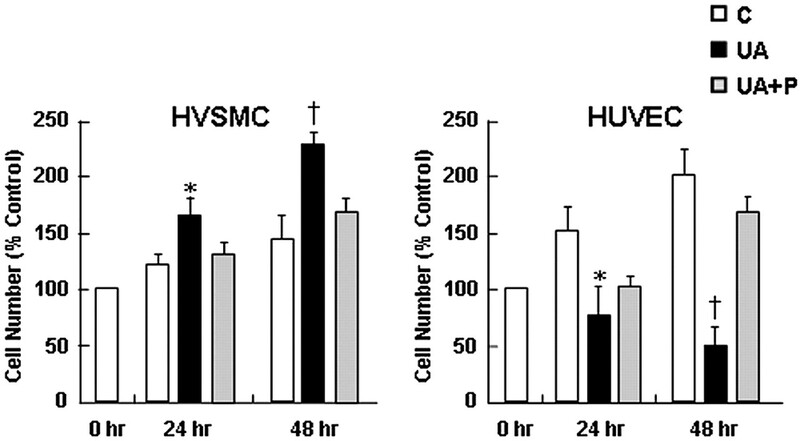 Dose (A) and time-dependent (B) effect of UA on CRP mRNA expression in HVSMC and HUVEC. UA increased CRP mRNA expression at 3 h in HVSMC and HUVEC at concentrations of 6.0 mg/dl or higher compared with control (A). *P < 0.05 versus UA 0.0, 0.6, and 3.0 mg/dl; †P < 0.05 versus UA 0.0, 0.6, 3.0, and 6.0 mg/dl. In HVSMC, UA-induced CRP mRNA expression peaked at 3 h and remained elevated at 24 h, whereas there was an earlier induction in HUVEC. LPS-induced CRP expression showed a different time response compared with UA (B). *P < 0.05 versus control and UA at corresponding time points; †P < 0.05 versus control and LPS at corresponding time points. To investigate the signal transduction pathway involved in UA-induced CRP expression, we evaluated whether there was activation of MAPK pathway. UA (9 mg/dl) activated p38 and ERK44/42 MAPK in both HVSMC and HUVEC (Figure 5). p38 MAPK activation was observed from 5 min to 4 h in HVSMC and HUVEC. Activation of ERK44/42 MAPK was also observed between 5 and 30 min and between 5 and 15 min after incubation of HVSMC and HUVEC with UA, respectively. It is interesting that SB 203580 (p38 pathway inhibitor) and PD 98059 (ERK pathway inhibitor) decreased CRP mRNA expression in HVSMC and HUVEC at 3 h (Figure 6). These findings implicate both the p38 and ERK44/42 MAPK signaling pathways in UA-induced CRP mRNA expression. Effect of UA on mitogen-activates protein kinase (MAPK) pathway activation. UA activated p38 (A) and extracellular signal–regulated kinase (ERK) 44/42 (B) MAPK pathway from 5 min in HVSMC and HUVEC. Western blots shown are representative of four experiments for phosphorylated and total p38 (A) and phosphorylated and total ERK44/42 (B). Effect of co-stimulation of UA with MAPK inhibitors and probenecid on CRP mRNA expression. UA-induced expression of CRP mRNA (9 mg/dl, 3 h) was blocked by inhibitors of p38 (SB203580, 5 μM), ERK44/42 (PD 98059, 10 μM), MAPK, and probenecid (P). *P < 0.05 versus others. 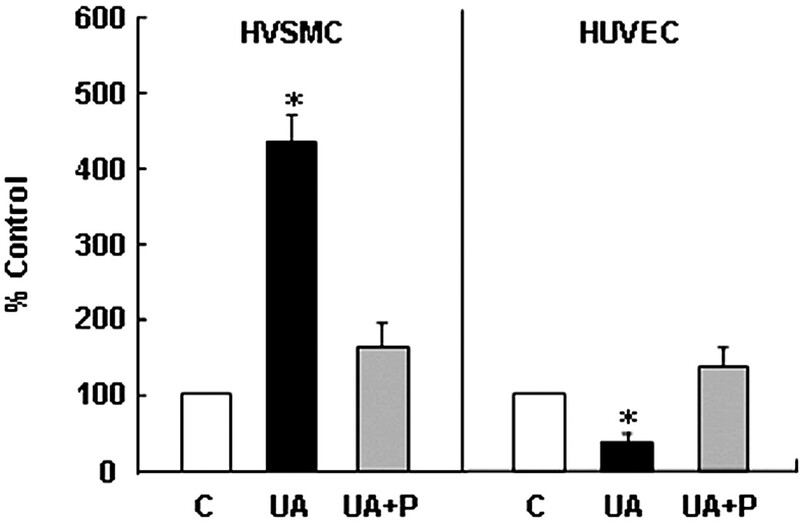 UA-induced upregulation of CRP mRNA expression in HVSMC and HUVEC was blocked by the organic anion transport inhibitor probenecid (Figure 6), consistent with data in rat VSMC in which UA-mediated effects could be similarly blocked by probenecid (26). This finding suggests that UA must enter into the vascular cells to induce CRP expression. UA-stimulated HVSMC showed an increased CRP from 3 to 48 h by Western blotting (Figure 7A). Induction of CRP occurred in HUVEC at 3 h (Figure 7B). UA also increased CRP release into media in both HVSMC and HUVEC (Figure 7C). Effect of UA on CRP expression and release. UA (9.0 mg/dl) stimulated CRP expression at 3 and 48 h in HVSMC (A) and at 3 h in HUVEC (B) by Western blotting of cell lysates (n = 6, representative blots shown). These effects were attenuated by probenecid (P). UA also induced CRP release into media in HVSMC and HUVEC with similar findings (C). *P < 0.05 versus control and UA+P at each time point. The observation that UA activated HVSMC and HUVEC led us to examine the effects of UA on cell proliferation and migration. UA dose-dependently stimulated [3H]thymidine incorporation at 24 h of stimulation, whereas DNA synthesis was inhibited in HUVEC (Figure 8). These effects were associated with parallel changes in cell number (Figure 9). Effective concentration of UA to stimulate DNA synthesis by two-fold (EC50) in HVSMC was 8.6 mg/dl, and effective concentration to inhibit cell proliferation by 50% (IC50) in HUVEC was between 6.0 and 9.0 mg/dl (7.8 mg/dl; Figure 8). Inhibition of organic anion transport with probenecid attenuated UA-induced alterations in cell proliferation (Figure 9). The inhibition of HUVEC proliferation was also accompanied by a significant decrease in NO metabolites in cell culture medium (Figure 10) that was similarly reversed by probenecid. Effect of UA on DNA synthesis of human vascular cell. UA (6.0 to 12.0 mg/dl) induced a significant increase in [3H]thymidine incorporation in HVSMC, whereas it inhibited HUVEC proliferation in response to 5% serum at 24 h of stimulation. *P < 0.05 versus UA 0.0, 0.6, and 3.0 mg/dl; †P < 0.05 versus UA 0.0, 0.6, 3.0, and 6.0 mg/dl. Effect of UA on human vascular cell proliferation. UA-induced (9 mg/dl) changes in [3H]thymidine uptake was associated with parallel changes in cell number. The effect of UA on cell proliferation was attenuated by probenecid (P). *P < 0.05 versus control and UA+P; †P < 0.05 versus control and UA+P at 48 h and UA at 24 h.
Effect of UA on nitric oxide production by cultured HUVEC. UA (6.0 to 9.0 mg/dl) inhibited total nitrite production in HUVEC, and this was blocked by probenecid (P) and anti-CRP antibody. *P < 0.05 versus control, UA+P, and UA+anti-CRP. UA (9.0 mg/dl) increased HVSMC migration and inhibited HUVEC migration, which was attenuated by co-incubation with probenecid (Figure 11). UA also stimulated cell migration in HVSMC using the modified Boyden chamber assay (245 ± 21% versus control; P < 0.05), whereas it inhibited 10% serum-induced migration in HUVEC (78 ± 29% versus control; P < 0.05). Pretreatment of cells with probenecid also abolished UA-induced alterations in cell migration in HVSMC and HUVEC using this assay. Effect of UA on cell migration. UA (9.0 mg/dl) stimulated HVSMC migration and inhibited HUVEC migration; these effects were ameliorated by probenecid (P). *P < 0.05 versus control and UA+P. Because CRP is known to alter the proliferation of cultured vascular cells (7–10), we also examined whether CRP expression had a pathogenetic role in the UA-induced changes in cell proliferation. Anti-CRP treatment for 24 h with UA resulted in a significant decrease in cell proliferation and migration of HVSMC, suggesting that UA-induced early expression of CRP is responsible for proliferation and migration of HVSMC (Figure 12). However, in HUVEC, cell proliferation and migration were comparable in the presence or the absence of anti-CRP (Figure 12), suggesting that CRP expression may differentially modulate the UA-induced vascular remodeling in HVSMC and HUVEC. It is interesting that UA-induced reduction in NO release in HUVEC was blocked with anti-CRP antibody, which suggests that CRP plays an important role in regulation of NO release in HUVEC (Figure 10). This finding is also consistent with the previous observation by Verma et al. (8) showing that CRP itself decreases NO release from cultured endothelial cells. Effect of CRP on UA-induced changes in cell proliferation. UA-induced (9.0 mg/dl) proliferation of HVSMC was blocked by anti-CRP treatment, whereas UA-induced inhibition in cell proliferation in HUVEC was comparable with anti-CRP. *P < 0.05 versus control. Systemic inflammation is an important determinant of cardiovascular morbidity (1,2). CRP is a sensitive marker of systemic inflammation and is a better predictor of cardiovascular events than LDL cholesterol levels in the general population (2). CRP also may contribute directly to atherosclerosis by causing leukocyte activation and endothelial dysfunction (4–6). The source of circulating CRP has been thought to be the hepatocyte (27). However, Calabro et al. (25) recently reported that human vascular cells produce CRP in response to inflammatory cytokines. Because we have observed UA-induced expression of proinflammatory peptide such as MCP-1 in cultured rat vascular cells (21), in this study we tested the hypothesis that UA-induced changes in vascular proliferation and function may be mediated by de novo production of CRP in human vascular cells. This hypothesis is especially relevant when we consider a marked similarity in vascular changes induced by UA and CRP (6–9,21–23). The first major finding in this study was that UA could induce expression of CRP in vascular endothelial and smooth muscle cells. Regarding CRP expression in healthy and diseased blood vessel, Yasojima showed intense signals for CRP mRNA in smooth muscle–like cells and macrophages by in situ hybridization in the thickened intima of atherosclerotic plaques (28). CRP expression in blood vessels assessed by immunohistochemistry was co-localized with the membrane attack complex of complement (28). Significant levels of a stable form of CRP were also detected in the blood vessels of normal human tissues (29). In human kidney, CRP immunoreactivity was found in proliferative glomerular disease along the capillary walls of glomeruli and peritubular capillaries and small vessels in the interstitium (30). The observation that CRP is constitutively expressed in vascular cells with increased production in response to UA stimulation provides a pathogenic linkage to explain the association of CRP, the systemic inflammatory response, and elevated UA in patients with cardiovascular disease and diabetes (12). Furthermore, this finding offers a new insight in that CRP may play a key role in the pathogenesis of cardiovascular disease not only as a serum-based molecule but also as a tissue-based molecule. In this study, soluble, endotoxin-free UA potently stimulated CRP mRNA and protein in both HUVEC and HVSMC. CRP expression was increased from 6 mg/dl, suggesting that even physiologic concentrations of UA stimulated CRP production under in vitro conditions. Calabro et al. (25) reported previously that inflammatory cytokines such as LPS could stimulate CRP synthesis in HVSMC but not HUVEC. We therefore compared the effects of UA with LPS on the CRP response. UA stimulation showed a different time course of CRP mRNA expression compared with LPS. LPS-induced CRP expression in HVSMC peaked at 1 h, whereas the peak occurred at 3 h with UA. We also found that both LPS and UA stimulated CRP mRNA early in HUVEC, but the effect was more prominent and longer lasting with UA. By 24 to 48 h, no CRP stimulation was observed in LPS-stimulated HUVEC, consistent with the report of Calabro et al. (25) in which they could not detect CRP release in HUVEC after 48 h of exposure to inflammatory cytokines. We also examined the possibility that specific MAPK are involved in UA-induced CRP mRNA expression. We have previously reported that p38 and ERK44/42 MAPK pathways are responsible for UA-induced cell proliferation and MCP-1 expression in rat VSMC (20,31). In this study, we confirmed the activation of p38 and ERK44/42 MAPK pathways and showed that these MAPK partially mediated the UA-induced increase in CRP expression in HVSMC and endothelial cells. A second major finding was the observation that UA could inhibit endothelial cell proliferation/migration and impair NO production. This suggests that UA is a true mediator of endothelial dysfunction and is consistent with studies in an animal model, in which the hypertension in hyperuricemic animal could be prevented by a NO substrate, l-arginine (21). The mechanism for the impairment of NO production will require further study and could relate to the expression of CRP (8). In addition, in the animal model of hyperuricemia, a reduction in endothelial NO synthase was observed in the kidney (32) with reduced serum nitrites and nitrates (33). Endothelial dysfunction may play a key role in the pathogenesis of hypertension and vascular disease (34); hence, the observation that UA can induce such changes at concentrations observed in humans may be of substantial clinical interest. Evidence that the mechanism of CRP expression, cell proliferation/migration, and NO production was truly mediated by soluble UA was provided several ways. First, we used only freshly filtered UA and demonstrated an absence of crystals by polarized microscopy both immediately and at the end of the experiments. Second, we ruled out endotoxin contamination with the limulus assay, and the pattern of stimulation was also different from that observed with LPS (see above). Finally, we were able to block the effects of UA with co-incubation with probenecid, which is an inhibitor of organic anion transport. We have also blocked the effect of UA on rat vascular cells using this approach (26). The third major finding was the observation that CRP differentially modulates UA-induced cell proliferation and migration in HVSMC and HUVEC. Although CRP was originally considered a marker of the inflammatory response, recent observations from several groups suggest that CRP also has a direct effect to promote atherosclerotic process and endothelial cell dysfunction. Our study also showed that CRP expression in HVSMC is responsible for cell proliferation and migration induced by UA. In HUVEC, CRP plays a key role in inhibiting NO release from UA-stimulated cells. At this moment, the significance and the mechanism of this differential effect of UA-induced CRP expression on HVSMC and HUVEC are not certain, and further studies are necessary to see the effect of UA and/or systemic inflammatory reaction on vascular remodeling in an animal model of hyperuricemia and humans with hyperuricemia. CRP is known to bind to phosphocholine and phospholipids within the cell membrane, and the major receptor for CRP on phagocytic cells is FcγRIIa (CD32) (35). Because CRP directly stimulates both VSMC and endothelial cells, we can speculate that both cells have specific receptors for CRP; however, at this moment, they were not identified yet. The differential effect of CRP on cell proliferation in these cells may be mainly related to cell-specific effects of CRP, but it also can be related to different expression of receptor(s) and receptor affinity for CRP in these cells. Recently, van den Berg et al. (36) reported that the direct in vitro effects of CRP on vascular cells that were examined using purified commercial CRP in previous studies may be due to azide and LPS contamination in commercial CRP, not by CRP itself. In our study, we used endotoxin-free UA (see Materials and Methods), and CRP released from vascular cells are different from commercially manufactured or in-house-generated CRP, which may be contaminated with chemicals or endotoxin. Therefore, the vascular effects that were mediated by UA-induced CRP in our study seem to be direct effects of CRP per se and do not seem to be related to contamination. We previously reported that soluble UA activates rat VSMC via a mechanism that involves urate uptake, activation of MAPK, stimulation of nuclear transcription factors, production of growth factors (PDGF), vasoactive mediators (COX-2 induced thromboxane), and chemokines (MCP-1) (20–22). An important aspect of this study is that the studies were performed in human vascular cells using UA concentrations that are clinically relevant. UA metabolism varies greatly between humans and most mammalian species, as a result of a mutation that occurred in early hominoid evolution that resulted in a loss of uricase in humans (31). As a consequence, humans have UA levels that vary between 3.0 and 12.0 mg/dl, whereas most mammalian species have UA levels of 0.5 to 1.0 mg/dl. Previous studies that have examined the effect of UA were performed on rat VSMC using concentrations two to five times the normal concentration in the rat (3.0 to 5.0 mg/dl). In clinical studies, several groups have reported that higher levels of serum UA independently increase the risk for the development of hypertension and renal disease (37). Our observation that UA induces endothelial dysfunction and HVSMC proliferation with a mediation of increased production of CRP provides a mechanism account for the development of hypertension and renal disease in patients with hyperuricemia. This is the first study, to our knowledge, to show that soluble UA, even at physiologic concentrations, has profound effects on human vascular cells. The observation that UA alters the proliferation/migration and NO release of human vascular cells, mediated by the expression of CRP, calls for careful reconsideration of the role of UA in hypertension and vascular disease. Further studies are also needed about the differential effects of CRP expression in HVSMC and HUVEC on cell proliferation and activation. This work was supported by grant R01-2005-000-10916-0 from the Basic Research Program and the National Research Laboratory Program of Korea Science & Engineering Foundation; Merck Medical School Grant Program; and the US Public Health Service grants DK-52121, HL-68607, and 1P50DK-064233-01. Sucrose, High-Fructose Corn Syrup, and Fructose, Their Metabolism and Potential Health Effects: What Do We Really Know? Uric Acid: An Old Dog with New Tricks?